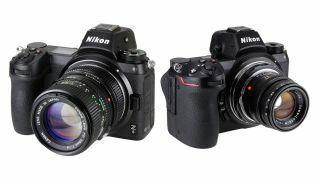 Japanese manufacturer Shoten has announced its latest lens mount adapters for Nikon's full-frame mirrorless Z system. The new products will enable users of the Nikon Z6 and Nikon Z7 to mount Canon FD lenses and, for the first time, Leica M lenses. For many photographers, lens adapters are a crucial part of their kit. Since they enable users of a given camera system the ability to use non-native lenses from a completely different system, they greatly expand the range of potential optics available to a particular camera. Obviously, this is even more relevant for a fledgling system like Nikon's Z series, which currently only has a handful of native lenses available (such as the Nikkor Z 14-30mm f/4 S and Nikkor Z 24-70mm f/2.8 S). Using lens adapters means that early adopters don't have to be constrained by the limited number of Z lenses, and can expand the optical scope of their system. The Shoten Mount Adapter CFD-NZ enables you to mount Canon FD lenses to your Z6 or Z7. While MTF Services announced such an adapter back in October, its version costs £250 / $329. By contrast, the Shoten version costs just ¥5,940 / £40 / $53. On the other hand, the Shoten Mount Adapter LM-NZ EX is the first of its kind. It facilitates the use of Leica M-mount lenses on Nikon Z cameras, and costs ¥10,800 / £68 / $89, making it one of the cheapest ways to dip your toe into the premium pricey waters of Leica kit. Each adapter uses rigid and highly durable brass parts on both sides of the mounting surface to make them more durable and accurate when attaching or removing lenses. The interiors of both adapters are also matte black, to reduce the amount of internal reflection that occurs. The Canon adapter is available in black, while the Leica adapter can also be purchased in silver to mount your lenses… if not your camera body.